After we have introduced in October the small crochet basket with embroidery, we have received several emails by MiaDeRoca readers to ask for some more small stitching patterns... Small meaning a height of less than ten rows. Of course, we could, as we are as well caught by the embroidery bug – for the start we have some hearts and and apple. Hearts always work great in all sizes, you can make borders with hearts, you can combine hearts of different and use many hearts in different colours on one piece. In autumn we are especially drawn to apples: the smell of a ripe apple, the lovely sound when biting into a fresh apple, apples in all varieties: in an apple strudel, as a baked apple and accompanying venison ragout with some mountain cranberry. Of course there are in a technical sense many apple fans: and now you can add a little apple to you iPad sleeve, adorn your iPhone case with a stitched apple and another apple will be placed on the laptop bag to carry your powerbook. These are vitamins for your eyes. When stitching the apple we recommend to use a stem stitch for the apple stem (what else one would ask), to have it a little broader than with a normal stitch. We used the stitching pattern to adorn our knitted tealight candleholders. Especially for beginners in embroidery, be they adult or kids, these small embroidery projects are perfect to start – they are quick to make and you will soon experience a sense of achievement. 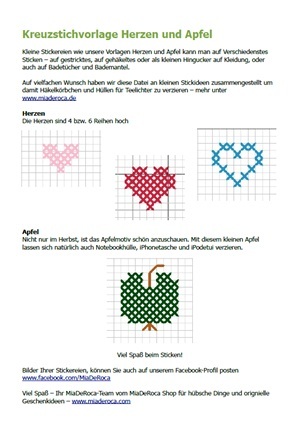 If you have never done cross stitch before or the last time has happened some years ago a few advices: for the design it does not matter very much which diagonal stitch to make firstly: It does not matter at all how the backside looks like, don't make anyone stop you from stitching by making perfectionist specifications. But: grab a needle, some yarn and give it a try. You won't get a grade once your embroidery is finished you do this to have fun. And if you show us your embroidery on our Facebook page www.facebook.com/MiaDeRoca you will definitely get a "like" from us.